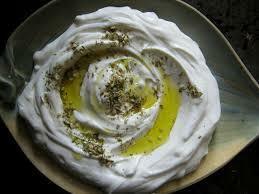 This is the Lebanese version of cream cheese, a lot tastier and lower in calories than most other cream cheeses. Serve on a plate, sprinkled with olive oil, olives, tomatoes, cucumbers and mint. Or simply spread it like cream cheese on pita bread. Mix or top with Mediterranean herbs like thyme and some fresh cracked pepper then use as a dip or spread for flat bread and crisp veggies. Drizzle with plenty of good olive oil! Roll into little balls, drizzle with olive oil and sprinkle with zattar (thyme, zumac and sesame seed herb mix) or other herbs and eat with pita.Optionally, shape into round bites and air-dry for a couple of hours before covering with olive oil in a glass jar. Amazing appetizer or gift! Use it liberally and drop a ball into chili, tacos, salads etc. YUM!